I always enjoy looking at signs in English (especially when they have humorous misspellings) and like to photograph them when I can. Here are a couple from our last bazaar trip. 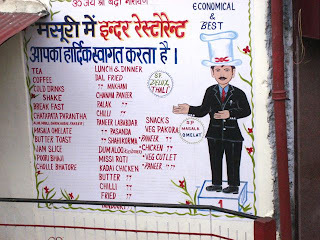 The menu from the Inder Restaurant (above the well-known Inder Bengali Sweet Shop in Kulri) is painted on the wall of the building. Sometime I must try some of their interesting items. I see this every week when we go for pooris at Agarwal's. This one is a small shop right across the corner from Picture Palace. I couldn’t resist its spelling of communication – an area in which we all struggle at times. 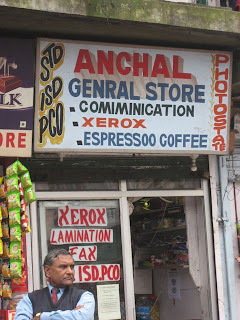 And how great that you can have a cup of "espressoo" while you get your Xeroxing done.